Since 2009, so 4 years now. It all started on New Year’s Eve in 2008, my brother and I were both obese and wanted something competitive to help shed the weight. So we agreed to run our first 5k in May 2009. It was the Fifth Third Riverbank Run. We both ran it and I became addicted to running and along the way, lost (as of now) 90lbs. Garmin! I love numbers and being able to look back at how I have progressed over the years. I do not obsess over the numbers while running, but find it very helpful during training that I keep to pace I need to be at. 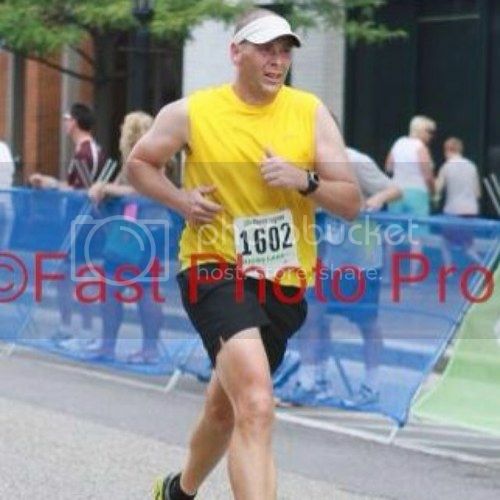 Hands down favorite is the Fifth Third Riverbank Run in Grand Rapids, Michigan held in the early May. They have a 5k, 10k, and 25k. I usually do the 25k and it is a rocking race! It is also the USTAF 25k championship race, so big name elites tend to show up for it. It is a must for any runner to experience it! You will have streaks of good runs and bad runs. Even after running 4 years and 2000+ miles a year the last couple of years, I still have bad runs. Do not give up on running and let those bad runs get you down. Know that the next run will most likely be better. But even if it is bad also, a string of good runs is around the corner. Plus find a race or partner to keep you going. Progress only happens after running day after day, week after week, month after month.